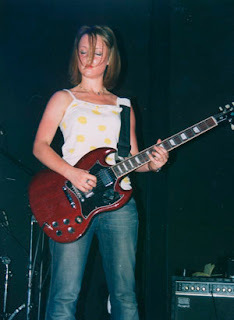 As guitarist with Electrelane, Mia Clarke provided a critical element to the group's sound, holding down rhythmic parts, contributing supportive counter melodies and delicate arpeggios, as well as rocking out with heavy riffs. Her extended solos during live shows were riveting improvisations that included glorious distortion and escalating squeals of feedback. Mia has also published extensive music criticism in a variety of outlets, notably in The Wire, and Pitchfork, among others. After about 10 years together, the band has taken an open-ended break that they are calling an "indefinite hiatus." While in Brighton, awaiting a visa to return to the US, Mia had time to answer a few of my probing inquiries about her early musical influences, the working method with Electrelane, guitar gear, and her newly adopted hometown of Chicago. Off the road for the first time in over a year, she is already very busy with a new band, as well as some exciting new projects and collaborations. Who or what influenced you to pick up the guitar? What made you keep playing? What were some of the first things you tried to play? When I was 15 I saw Fugazi in my hometown of Brighton, England. It was the first time I went to a show by myself, and remains one of my strongest memories; it was the beginning of everything in terms of my love of music and desire to play it, and that feeling was so exciting. The day after the show, I went to the pawn shop down the street and bought an electric guitar for about 30 pounds. I never really took to playing other people's songs, although I did give a few Bob Dylan covers a shot. I became bored practicing alone in my bedroom and wanted to be in a band, playing with other people. Then, a little while later, I joined Electrelane. I consider that as the time I really began playing guitar, and I still think that writing music with other people, and getting comfortable improvising, is one of the best introductions to learning an instrument. What was the first band you ever saw perform live? Radiohead, 1996, in Brighton, when I was 13. If you hadn't pursued a career in music what might you be doing otherwise? I probably would have focused on writing, or become a zoologist. When I saw Electrelane perform I don't think I noticed you using any ear protection - any thoughts or concerns on extended exposure to volume? That's very perceptive of you! Foolishly, I never used earplugs when I rehearsed or played live shows with Electrelane, as I found them very difficult to get used to. It felt like playing music inside a fish tank! However, I now have a proper pair, fitted to my ears, and use them all the time-- in fact, I can't imagine playing without them. The sound that Electrelane came up with was quite unique, not entirely "rock" or "pop." To what do you attribute the unique style that the band achieved? I think it was a combination of everyone's musical background and interests. Ros and Verity were classically trained when they were younger, whereas Emma and myself were not. I think this produced an interesting dynamic when we were writing songs together, particularly in terms of the structure of songs. At times there could be conflict, but I think it generally kept things interesting. And, although we shared a love of many of the same bands, we each had our own areas of interest, and I think this came through in our ideas when improvising together (which is how almost all of our songs first took shape). How do you view the role you had in helping to shape the Electrelane sound? I'm really not sure! I think the 'Electrelane sound' developed as a result of the four of us writing music together, and playing off one another's ideas. It's hard to say exactly how much a particular instrument affected the overall sound, as it was part of the whole. Are there unreleased items by Electrelane that might see the light of day, interesting demos, alternate takes, videos? There are a couple of unreleased songs knocking around, but not many. We recorded lots of different radio sessions over the last few years, so there's quite a bit of material from those, plus personal video footage that we shot while on the road. We released 'Electrelane: Singles, B-Sides, and Live' a couple of years ago, which complied a few previously unreleased tracks. It would be great to release a disc of live material one day, or even a DVD, but we don't have any plans at the moment. What were your feelings toward the end of your last tour about the band and the future, knowing the end was eminent? How well are you adjusting to not being on the road now? I felt it was the right time to move on and, personally, I needed the change. Of course the last tour was emotional for everyone, and it was a very surreal experience-- sometimes sad, sometimes fun. Our final show, in Brighton, was very intense. I miss the momentum of touring a lot though and would love to get back on the road soon. I get 'itchy feet' very quickly! An Electrelane show seemed to slowly build on rhythmic propulsion until it would have to stop, or just explode from its own momentum. What was it like to have to come down from that level of intensity night after night? It was generally a real rush, and could be so much fun. We often felt exhausted after playing, especially headlines shows. There's rarely much time to relax after playing though, as we'd usually have to sort out the merch stall, pack up, load the van etc. A few beers would help though! It was always rewarding to play a show after a long day driving, or being stuck hanging around a venue. I know you used your Hagstrom guitar on tour, and I think you were using a Vox amp. Can you give us a list of the equipment you used on tour? I used the Hagstrom, which replaced the Gibson SG I had been using for years, and the Vox Amp. The only other gear I had were pedals, all Boss: Overdrive, Tuner, Digital Delay, Compression Sustainer, and Tremelo. Do you suffer from "gear lust?" Do you look through instrument catalogs and go to music stores and look longingly at amplifiers and guitars? You've written quite a bit music criticism, would there be a book in your future? You've reviewed a wide variety of music, how do you keep up with new music, where do you find it? What bands are you enthusiastic about right now? I mostly find out about new music through friends, reading blogs, or records that are sent for review. Some of my favourite new-ish music at the moment is: Nalle, James Blackshaw, Disappears, Awesome Color, Hauschka, Anni Rossi, Birthmark, Entrance, No Age, No Blue, Head Of Skulls, Tiny Vipers. How would you characterize the style of your new band? Who's in it and what do they play? Does the band have a name yet? Well, it's early days, and we are still in the process of working on songs (no name yet, either). The material so far is pretty heavy; it's been great to let go a bit more and also have the challenge of playing with different people. The band is myself, Tony Lazzara (ex-Atombombpocketknife, Sterling) on drums, Colin DeKuiper (ex-Russian Circles) on bass, and Eric Chaleff (also of Sterling) on guitar. A friend of ours recently commented that this new band sounds like a conglomeration of all our previous bands, which is accurate and makes sense. How do you find Chicago as a city for Indie music? What are some of the good places to hear music there? Chicago is an excellent city to play music in. First off, it's relatively inexpensive, so it's possible to find a place to rent and a decent practice space for not too much money. Secondly, people involved in the music scene are just so supportive of their community, which is not something I experienced while growing up in Brighton, which was a much more dog-eat-dog environment. It was so refreshing when I first started spending time in Chicago, seeing how much bands are willing to help each other out and be supportive when others do well. It's very positive. Did you ever meet Sarah Cracknell of Saint Etienne? She has mentioned she's a fan of Electrelane, and even says "I believe in Electrelane" in the song "Finisterre." Yeah, I know that song! We were really touched when we heard it. I haven't met Sarah Cracknell, but we were once interviewed by Bob Stanley for a piece in Mojo magazine a few years back. I know Verity jumped into another music project already, what are Ros and Emma up to? 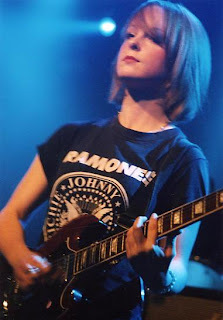 Ros does a solo project, called Ray Rumours, and plays in quite a few other bands as well, such as SiSiSi SiSiSi SiSi, which is so great. I don't know what Emma is doing, but I think she plans to keep playing music too. You've been in a critically acclaimed band and toured the world, what goals do you have now? I definitely want to keep playing music. I actually just got back from Amsterdam, where I recorded a guitar improvisation (or 'guitargument' as we were calling it) with Andy Moor of The Ex. That was great, and I'd really like to collaborate more with other people as well as working on this new project. Music aside, I am hoping to go back to school next year, but in the meantime plan to keep writing. I also co-edited and compiled (with Sara Jaffe, formerly of Erase Errata) a book of photography, artwork, and writing done by musicians while on tour/inspired by touring, which is going to be published by Yeti this autumn. We've been working on it for a while, so it will be very exciting when it finally comes out! Great, great interview. Thank you so much!